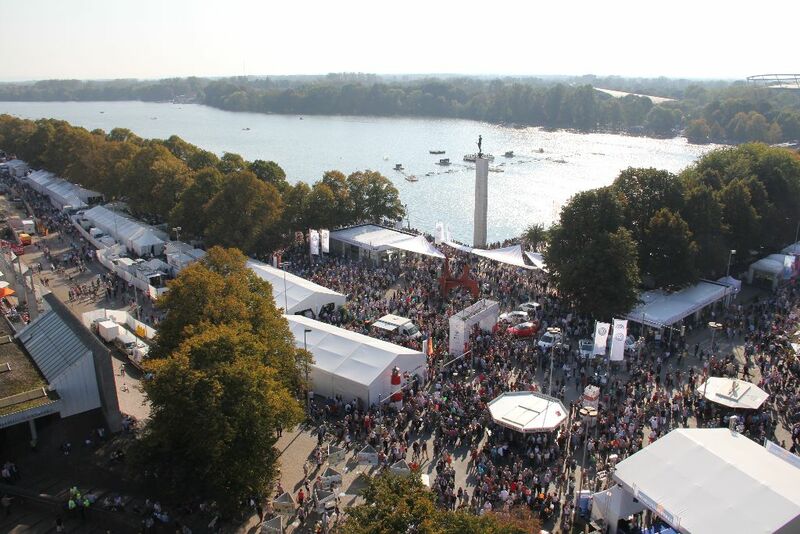 Zelte Frank also constructed the building for the Day of German Unity in Hanover. 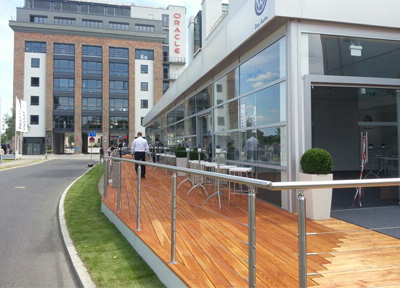 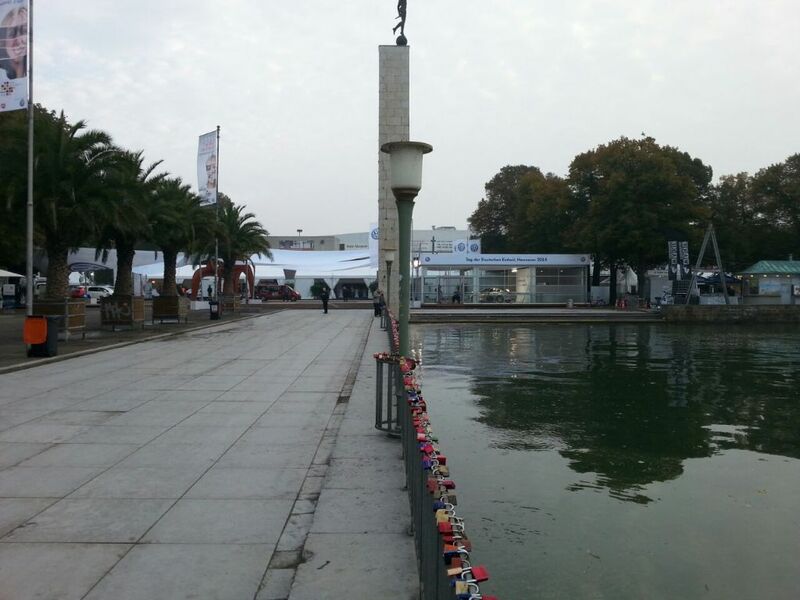 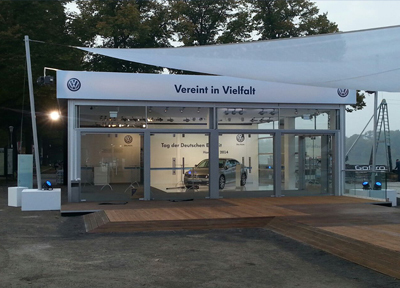 Zelte Frank erected three buildings on the shore of Maschsee so that Volkswagen’s products could also be presented in the best manner to visitors from all federal states on both days of the event. 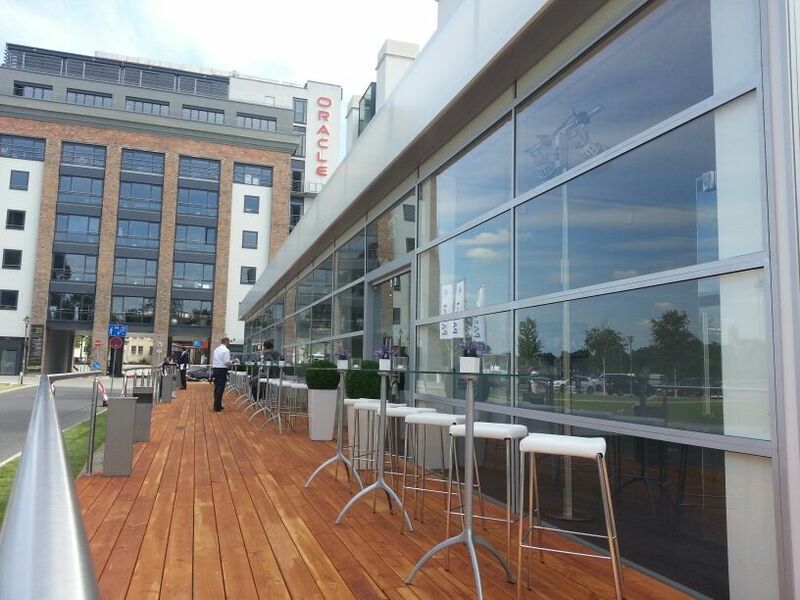 Here the biggest challenge was to adapt two buildings to the trees on site in terms of height, width and length whilst respecting their functionality. 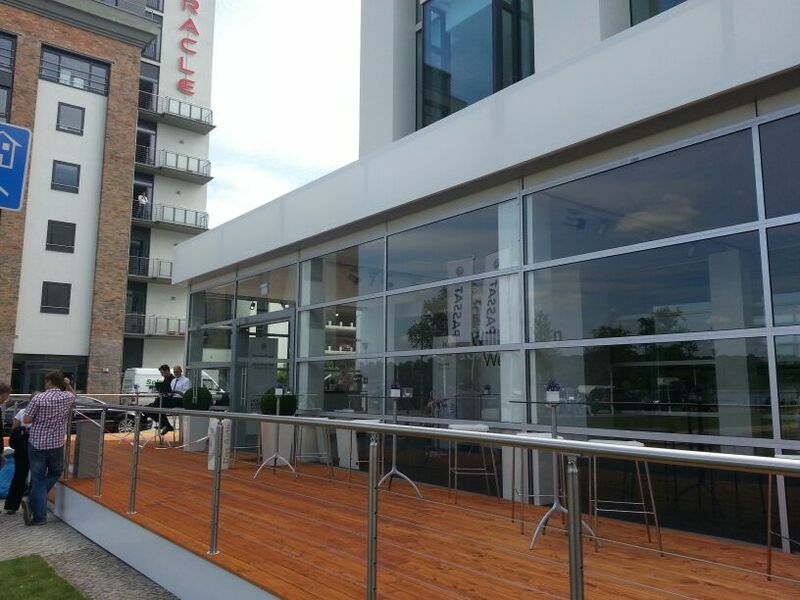 To this end, a structure of a special height was built in the preparation phase and, after consultation with structural engineers and inspection authorities, a structure of special width was used. 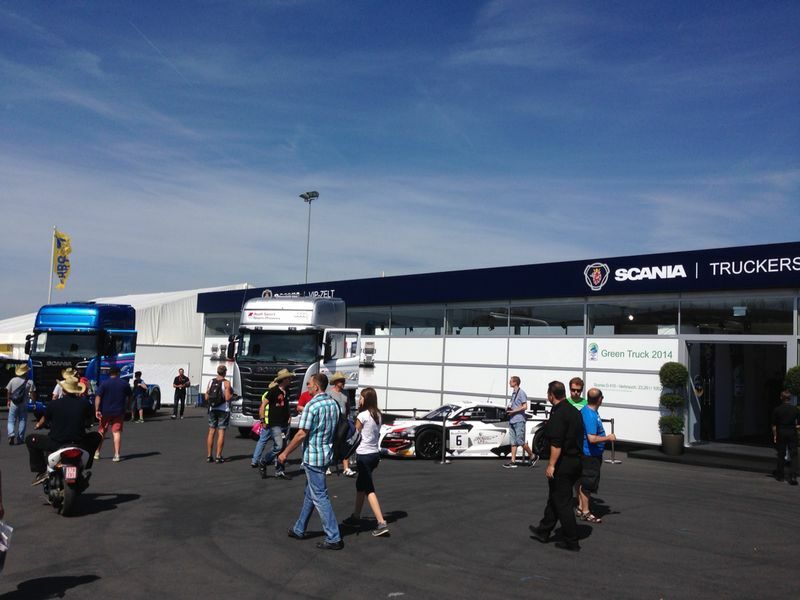 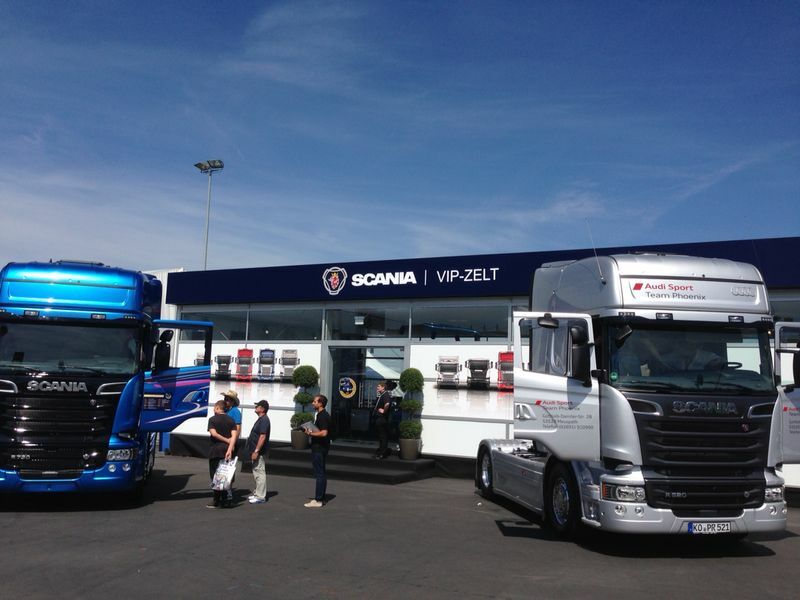 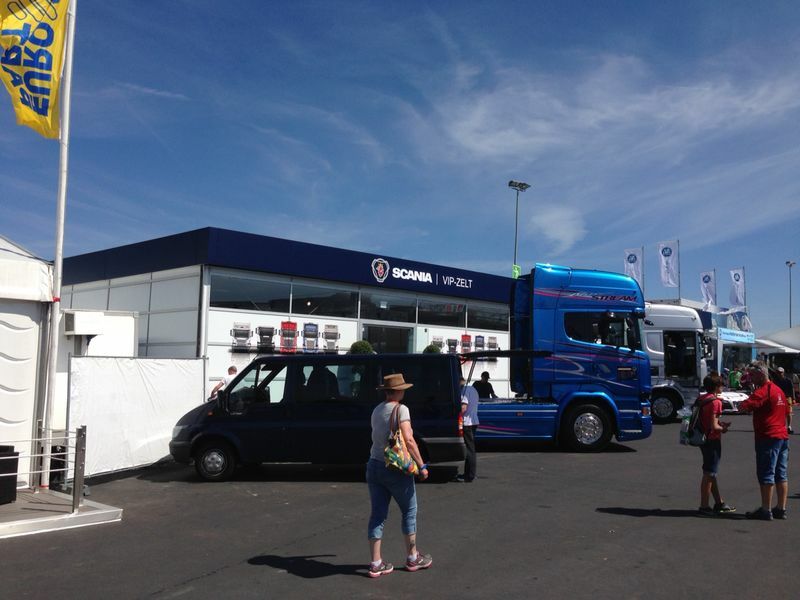 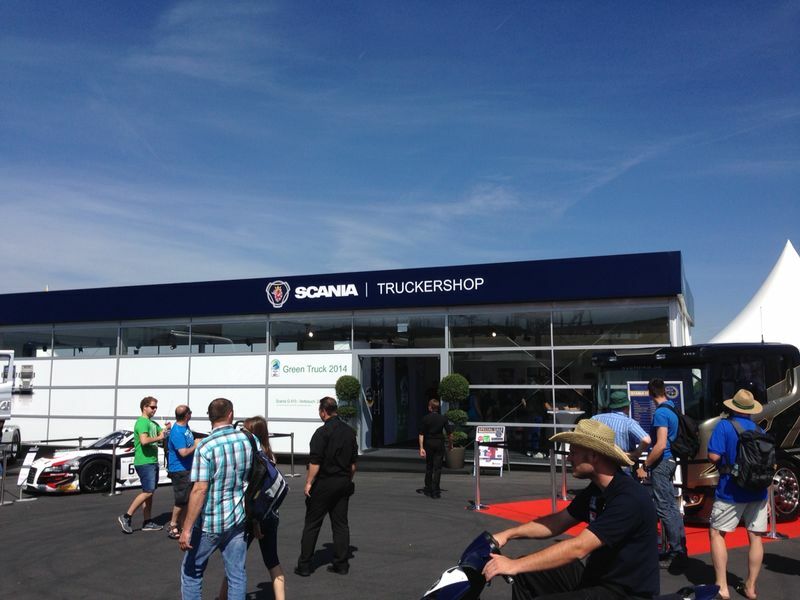 Once again SCANIA Deutschland entrusted Zelte Frank with the implementation of the entire project at the Truck Grand Prix 2014 at the Nürburgring. 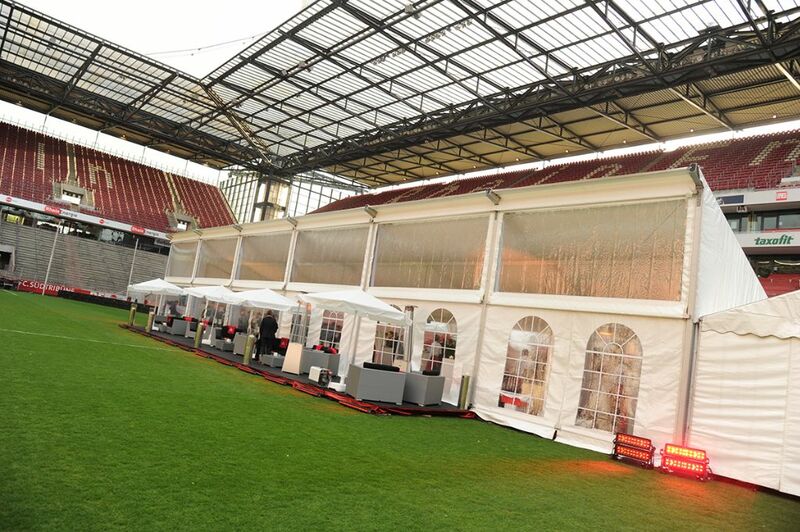 In addition to the construction of the marquee, Magdalena Kruz, the Project Leader, took care of all the furniture and fittings and décor, organised the fitting out of the fan shop and also arranged the branding of furniture and fittings, facia and façade. 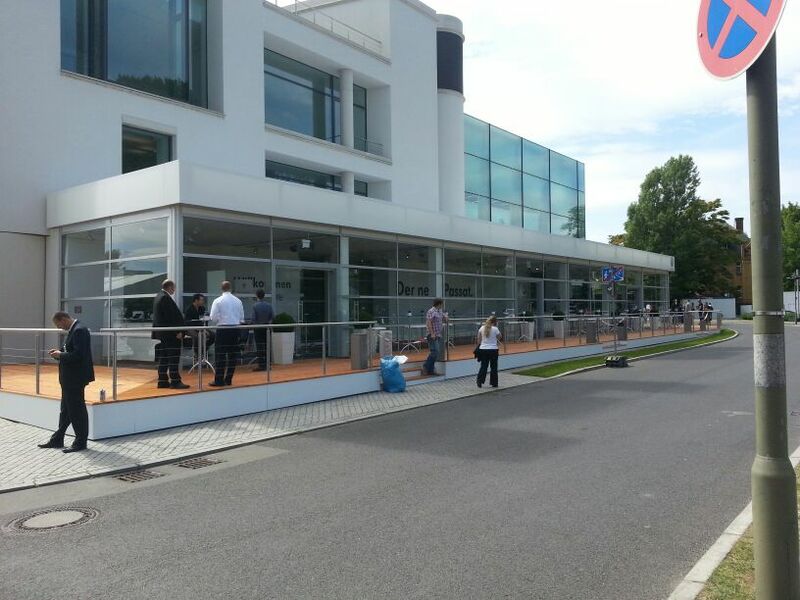 This led to some totally new variants of the existing façade and facia system. 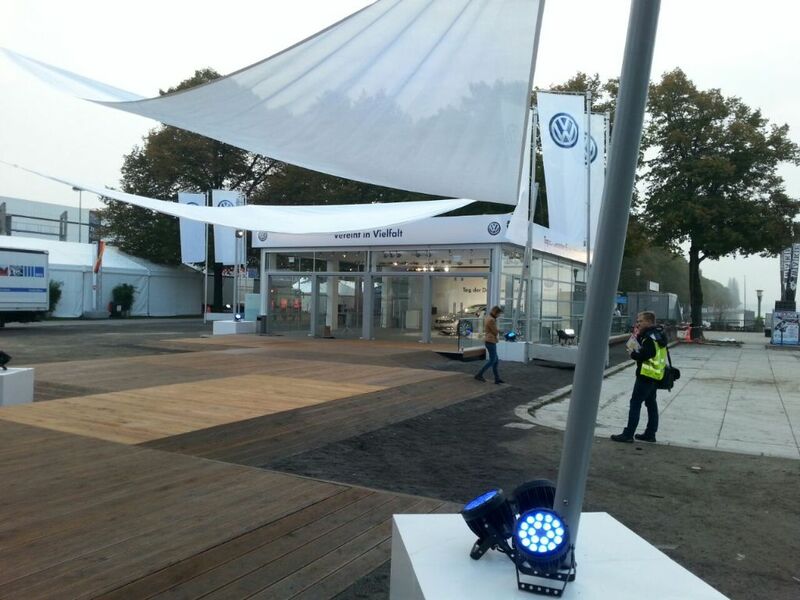 This year VW entrusted Zelte Frank with the implementation of two very important presentations. 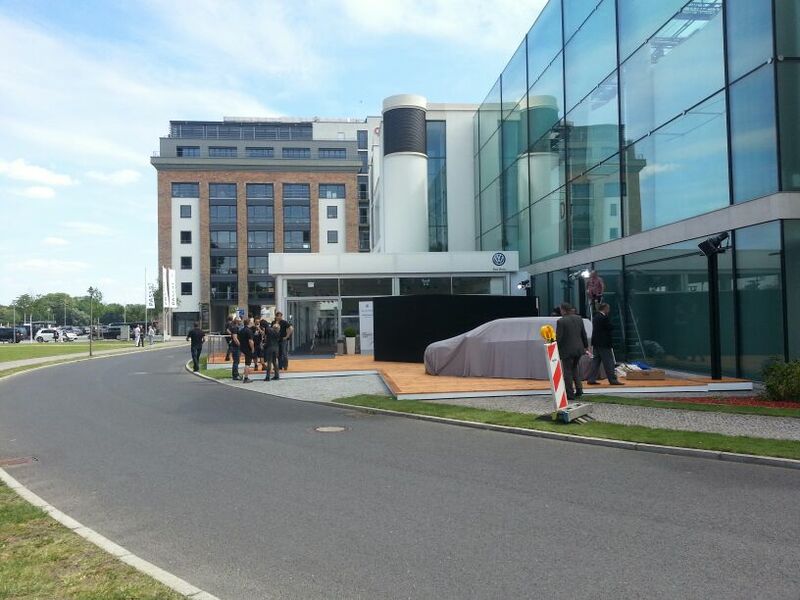 For one of these, Zelte Frank built a special structure at the Volkswagen Group’s Design Centre in Potsdam based on the existing building in form, size and design. 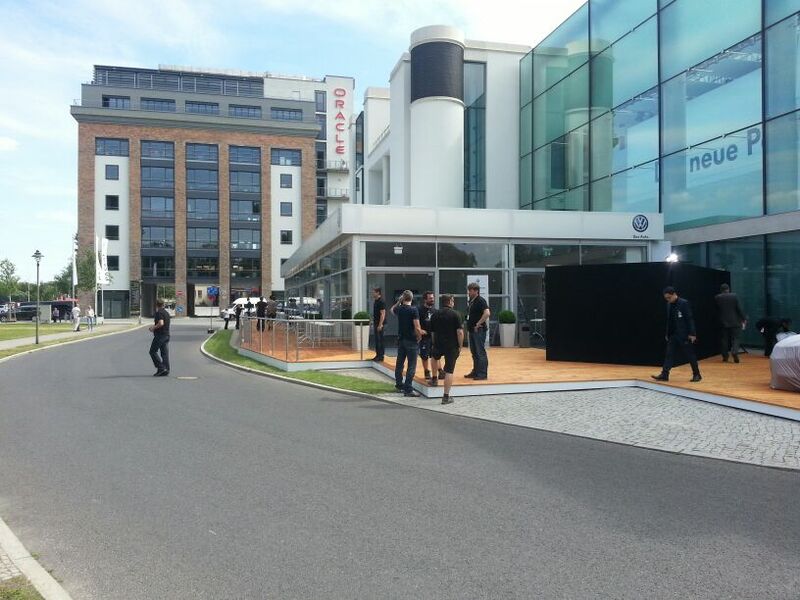 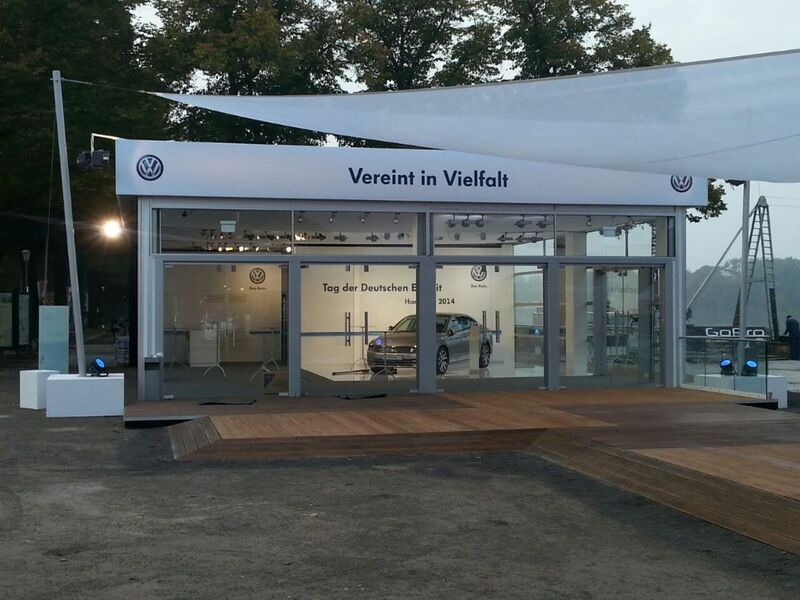 Then the new VW Passat was presented to a world audience here. 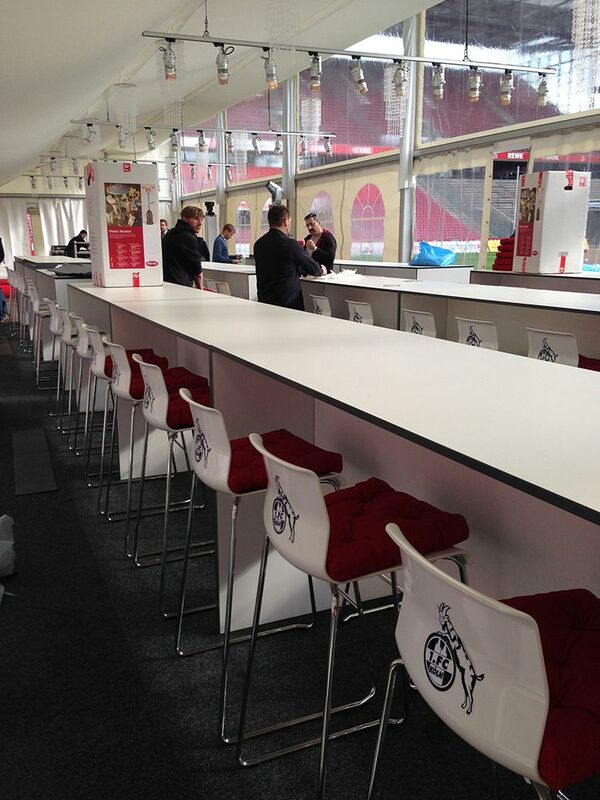 In 2014, Zelte Frank was tasked by its long-time partner, the German football club 1. 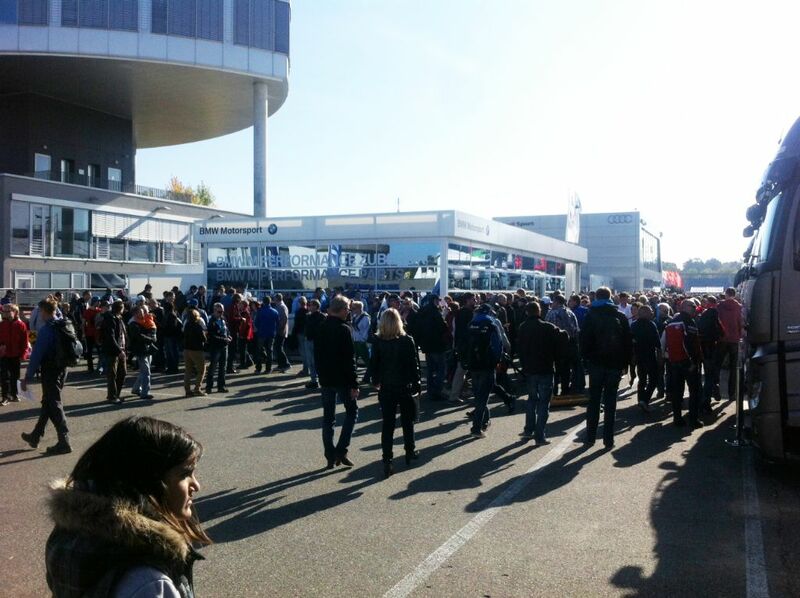 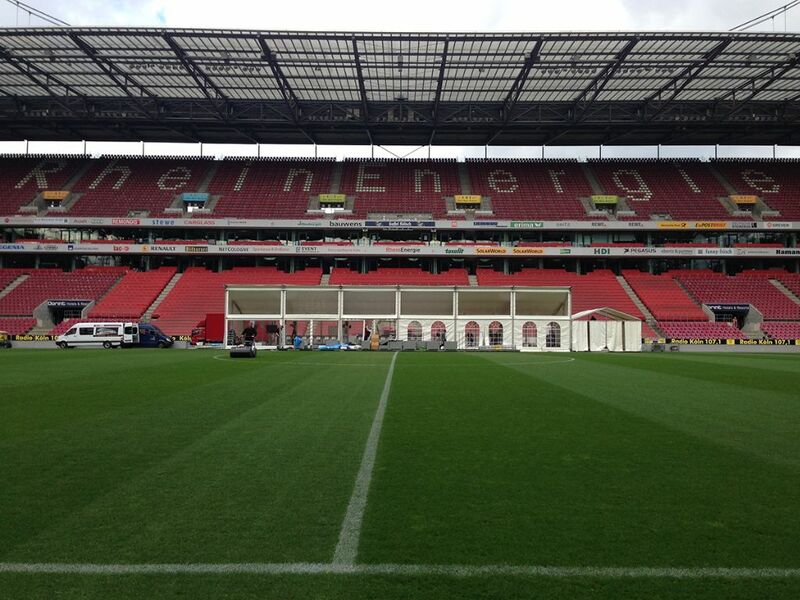 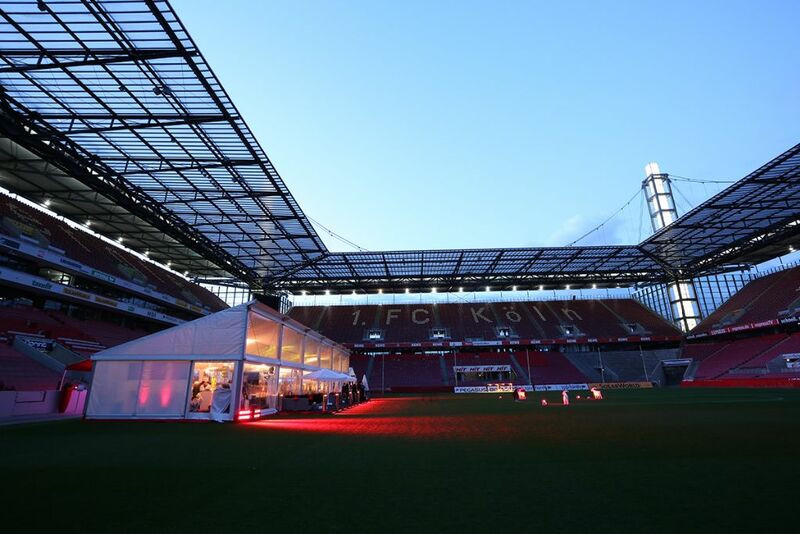 FC Köln, with the realization of a number of tent constructions. 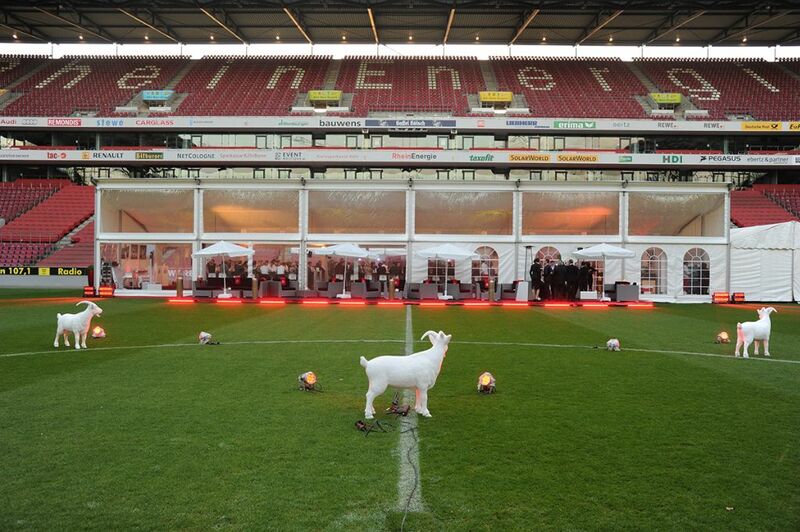 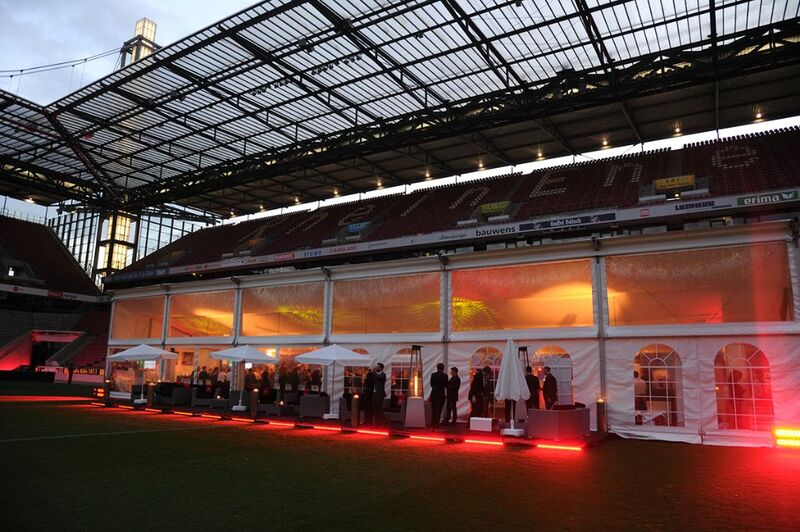 The first of these was at an event on the hallowed pitch of the RheinEnergieStadion in Cologne. 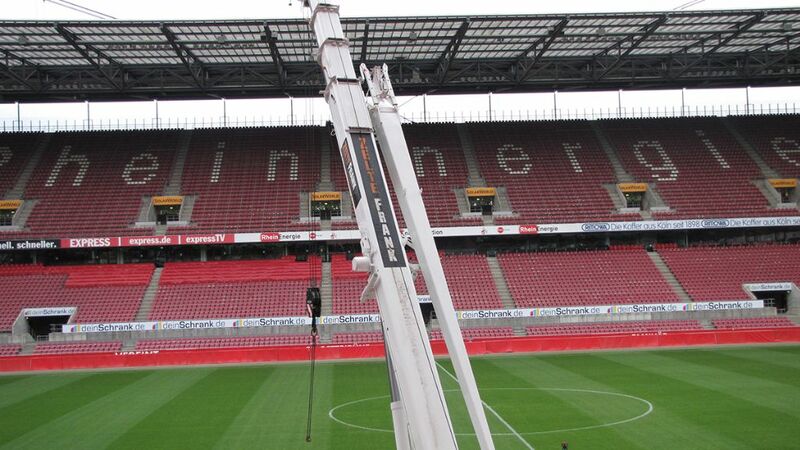 In order to prevent any damage to the pitch, floor systems were selected, which only required a minimum area for underpinning. 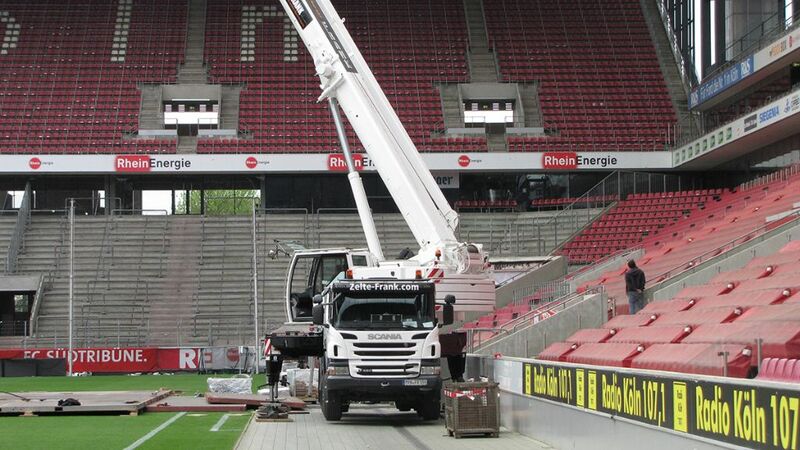 Additionally, Zelte Frank’s own mobile crane was utilised in order to limit the travel paths of the assembly personnel to the minimum required amount. 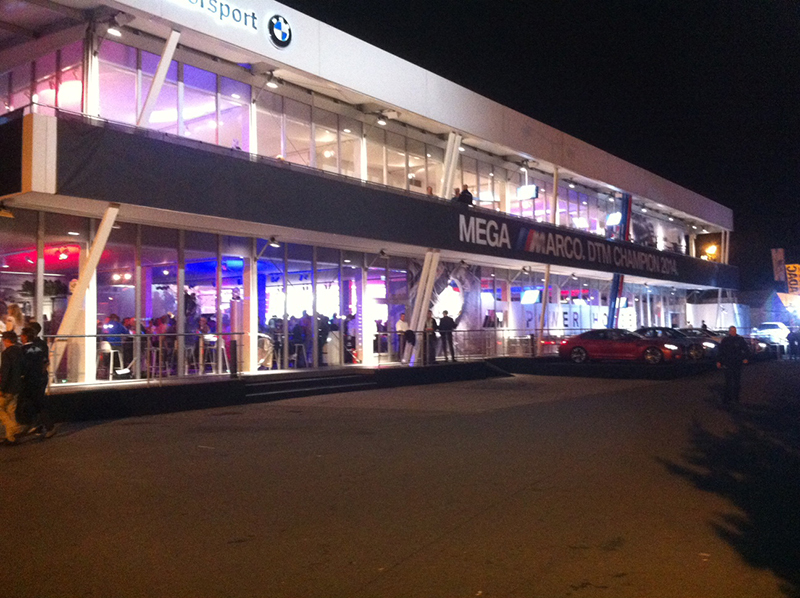 A special construction “lean-to roof” with a side height of 5.60 metres was used. 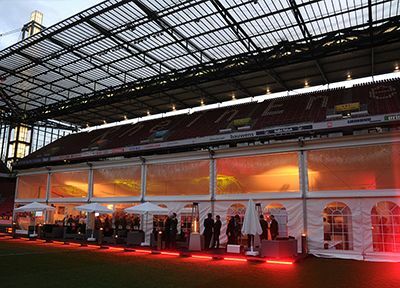 As a result, the guests were able to enjoy all-round visibility into the lit stadium. 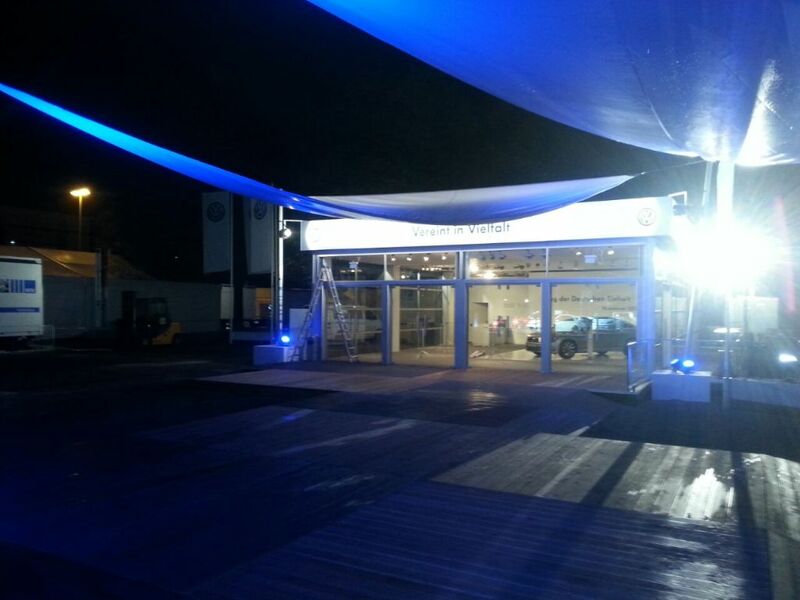 The assembly time was 24 hours, disassembly was completed in 10 hours. 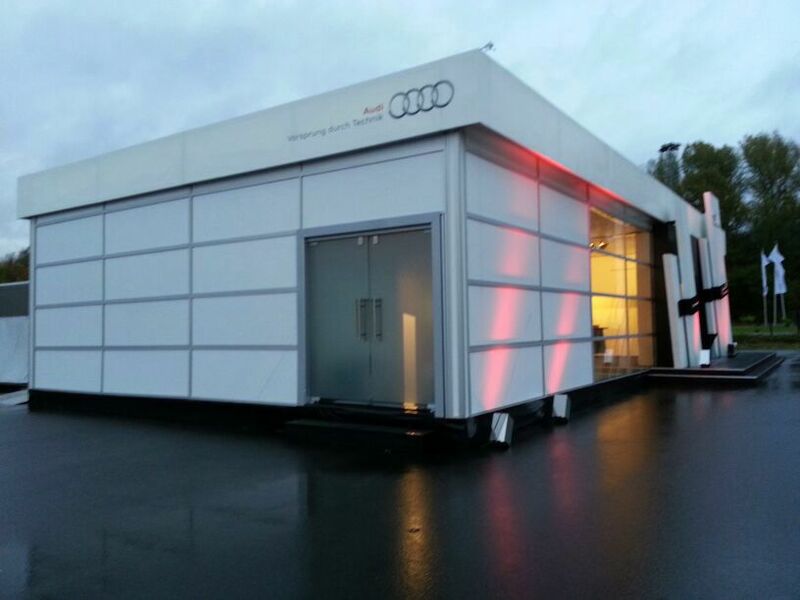 Zelte Frank installed a new tent system for a 6-week roadshow celebrating 30 years of the highly-successful Audi Quattro Gmbh. 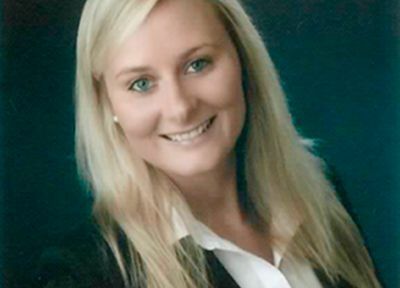 To strengthen the Zelte Frank marketing team, Ms Magdalena Kruz – who has extensive knowledge of foreign languages – will assist our customers in other European countries. 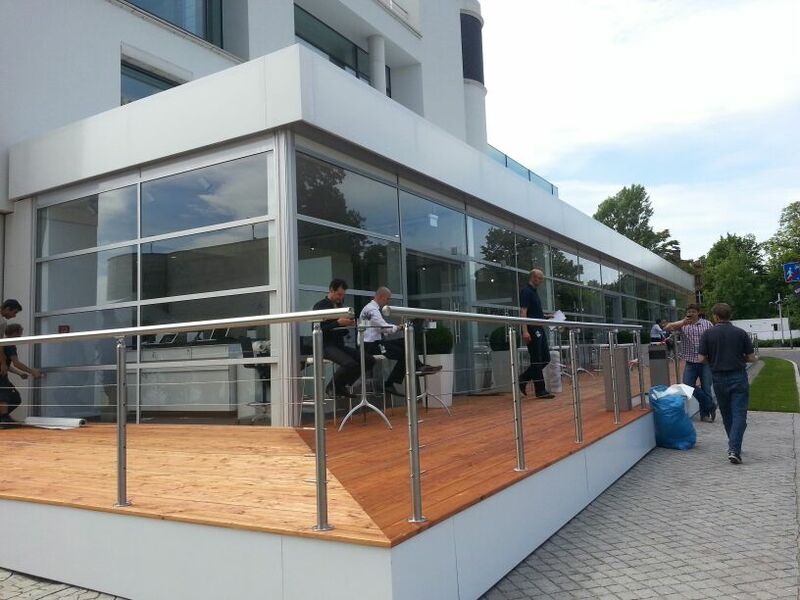 Ms Kruz comes from the aluminium manufacturing industry and has international marketing experience. Not just fast cars but tractors and agricultural machinery too will be provided with top-quality presentation by Zelte Frank. 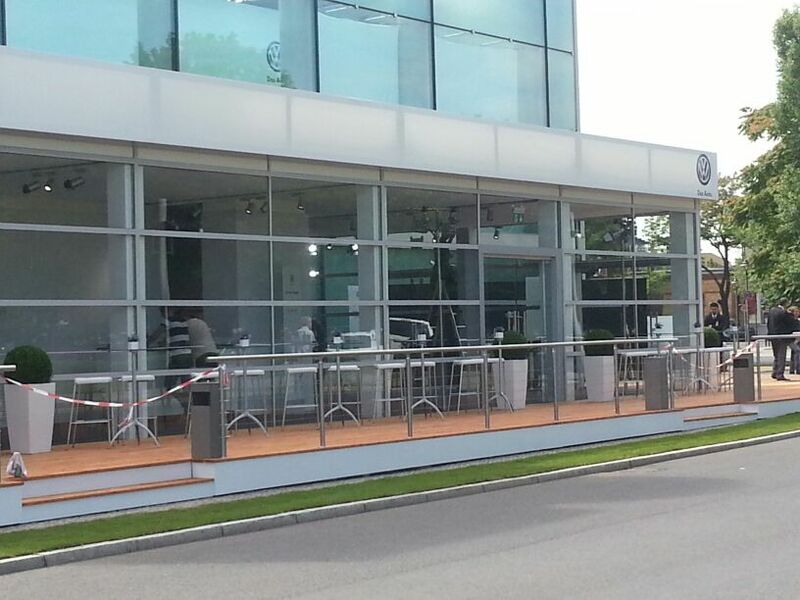 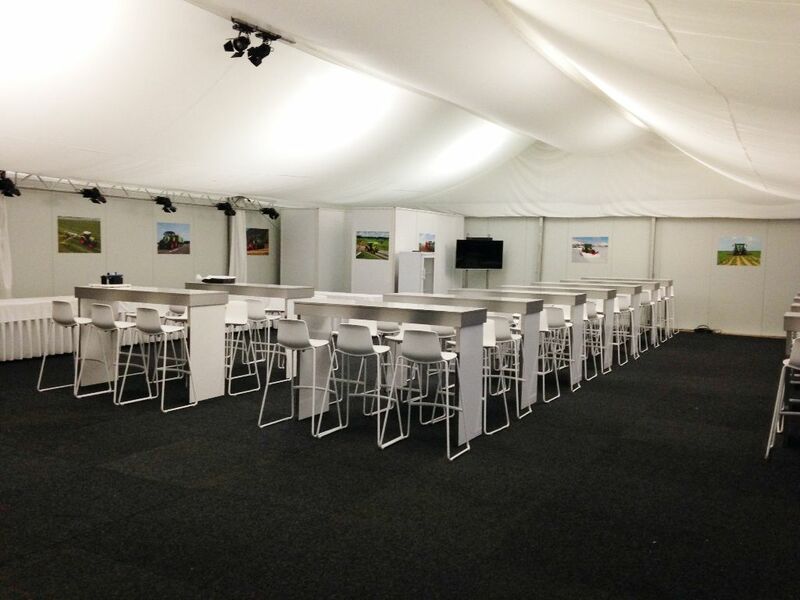 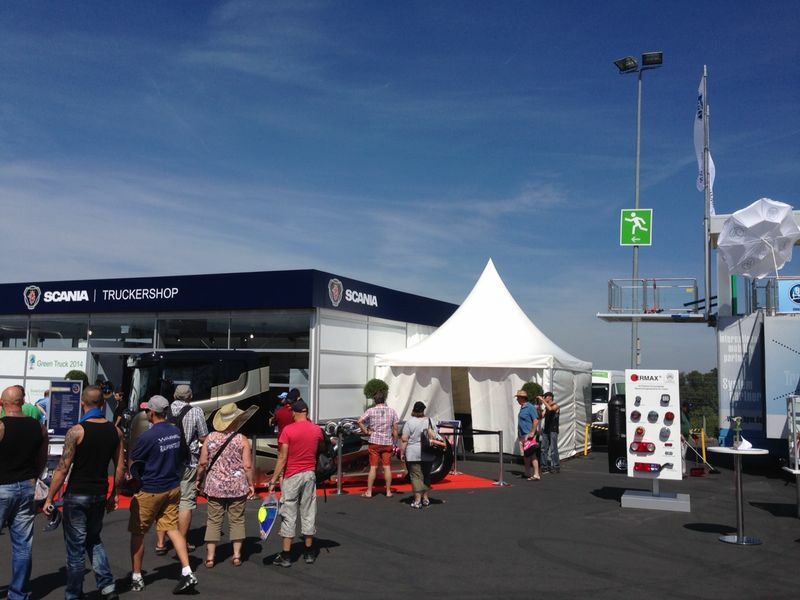 For our new customer CLAAS from Üntrop, a global group of companies, presentation tents were set up. 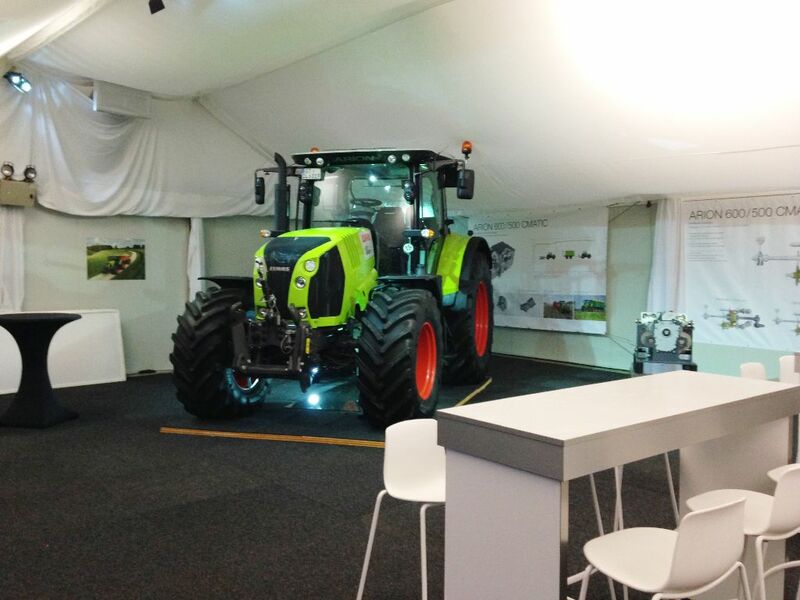 A 9-ton, 4-metre high tractor model was incorporated into the tent. 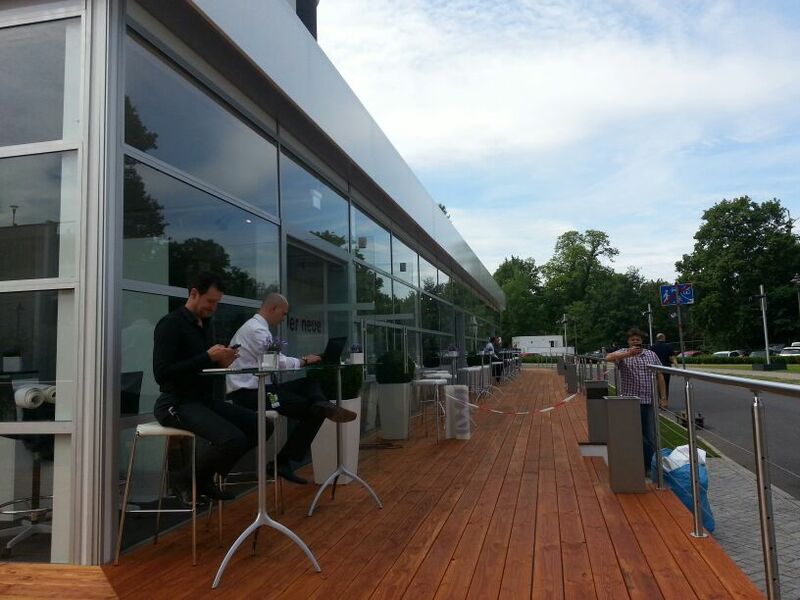 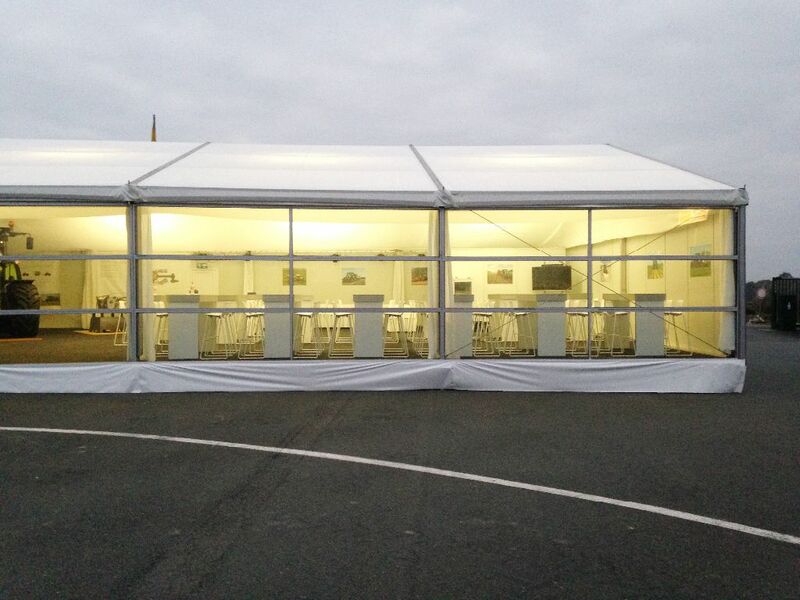 Zelte Frank also installed the heating for the tent, the furniture, decoration and TV technology. 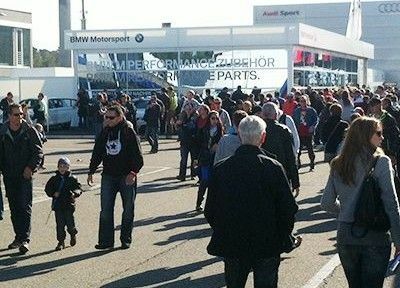 To provide the many fans and customers with sufficient room to show their support and celebrate, the guest hospitality facilities at BMW were extended for the season finale of the DTM (German Touring Car Masters). 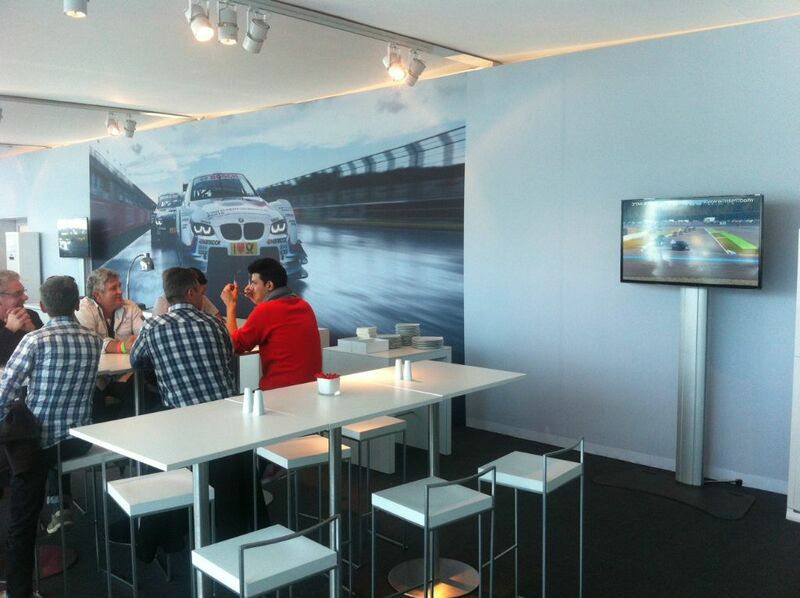 In conjunction with the leading agency Brandscape, a new internal room layout was developed to offer all interested BMW fans an even more intensive DTM experience. 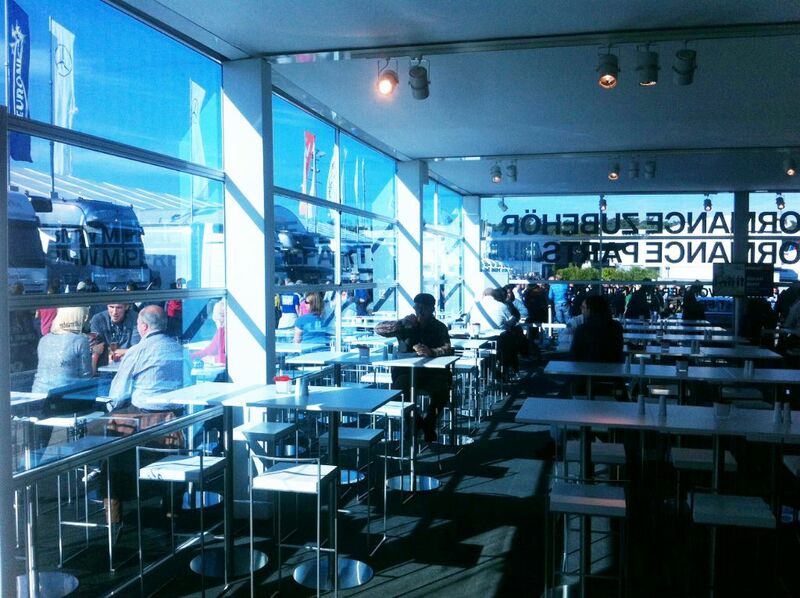 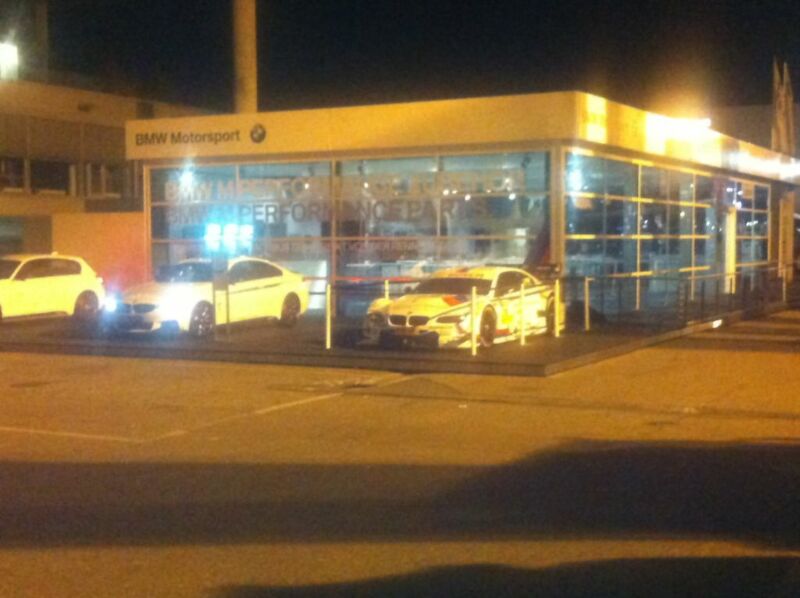 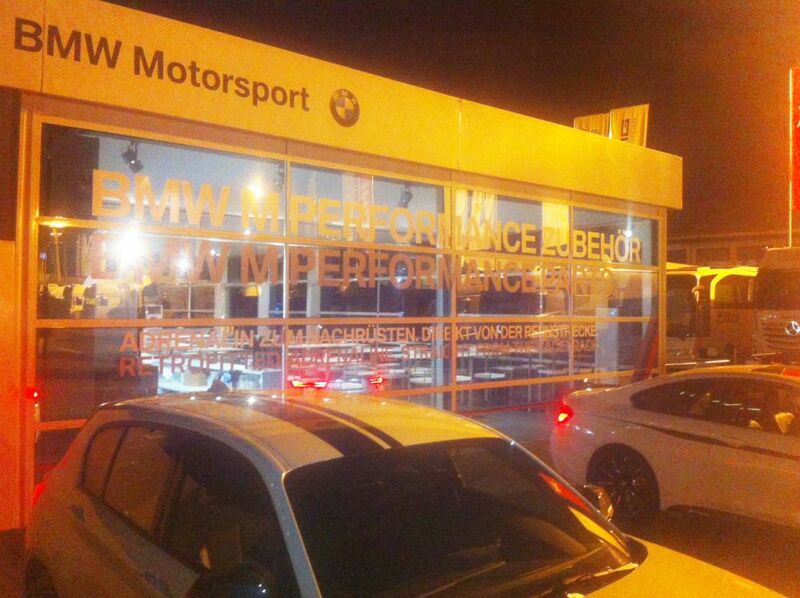 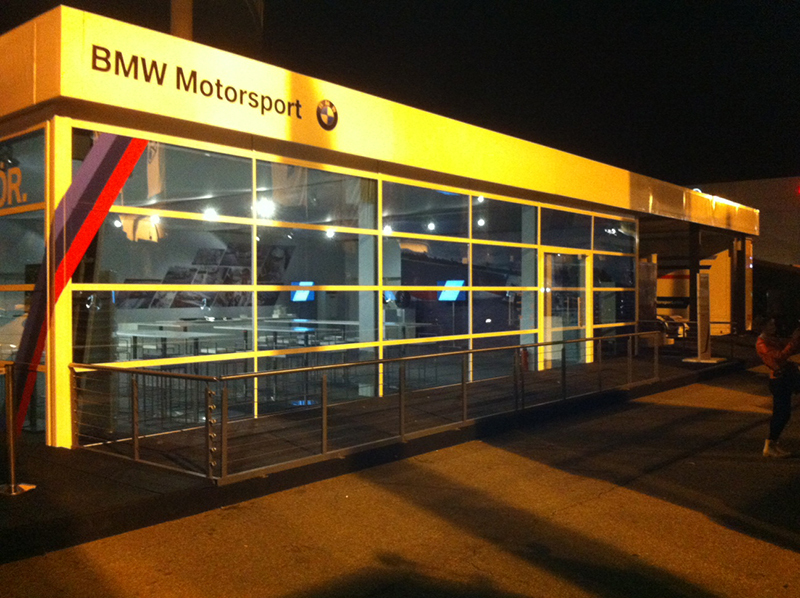 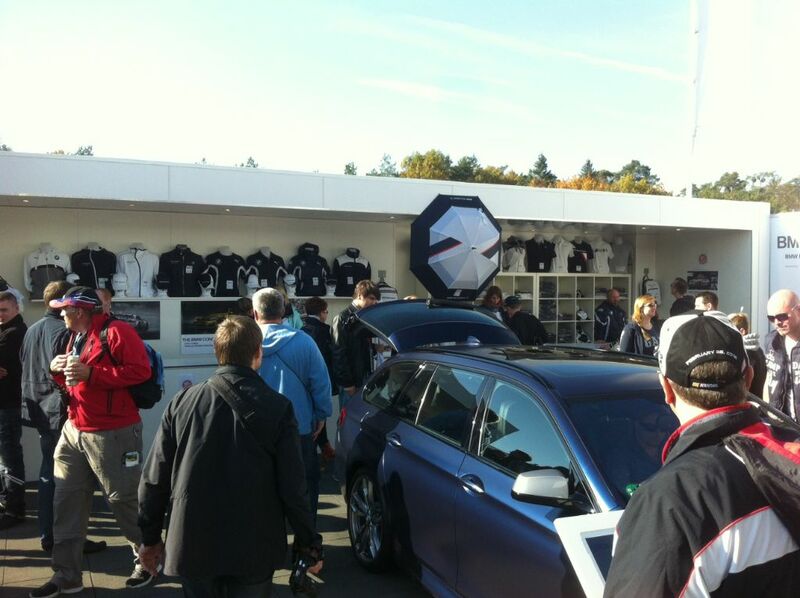 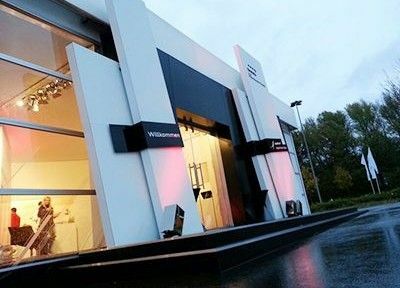 The floorspace of the BMW brand environment was extended and complemented with an additional fan shop container. 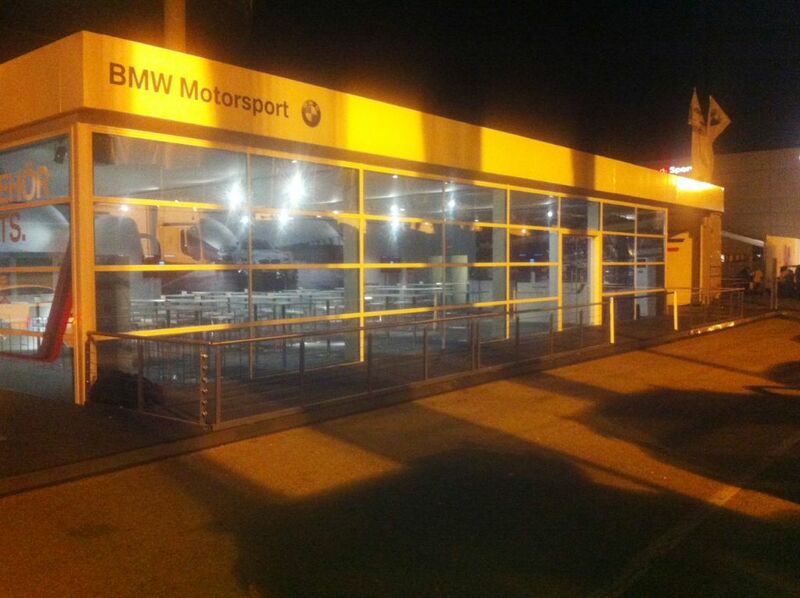 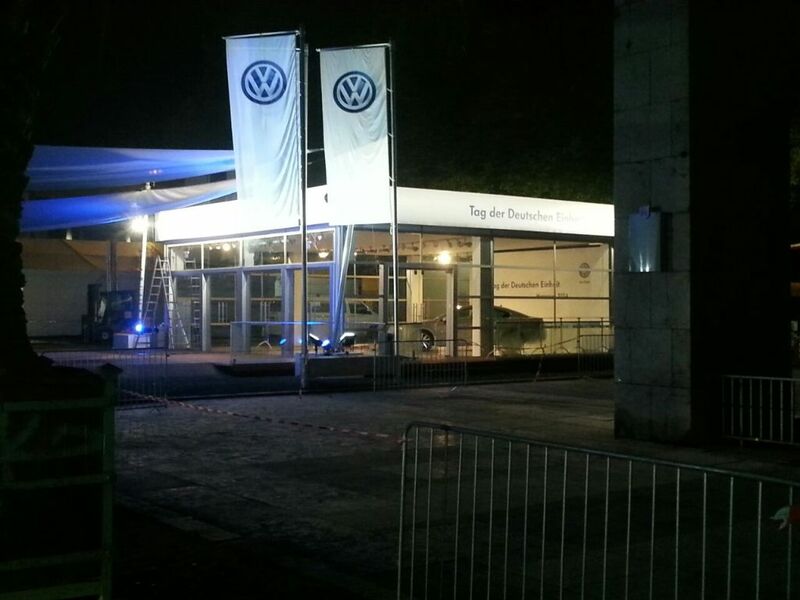 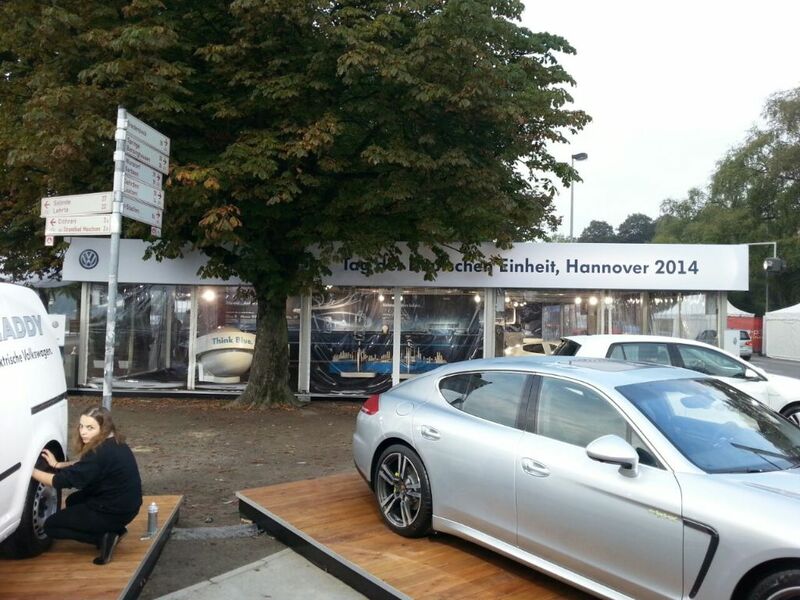 A tent was also erected at the same time to serve as a contact and supply point for 2,500 BMW employees. 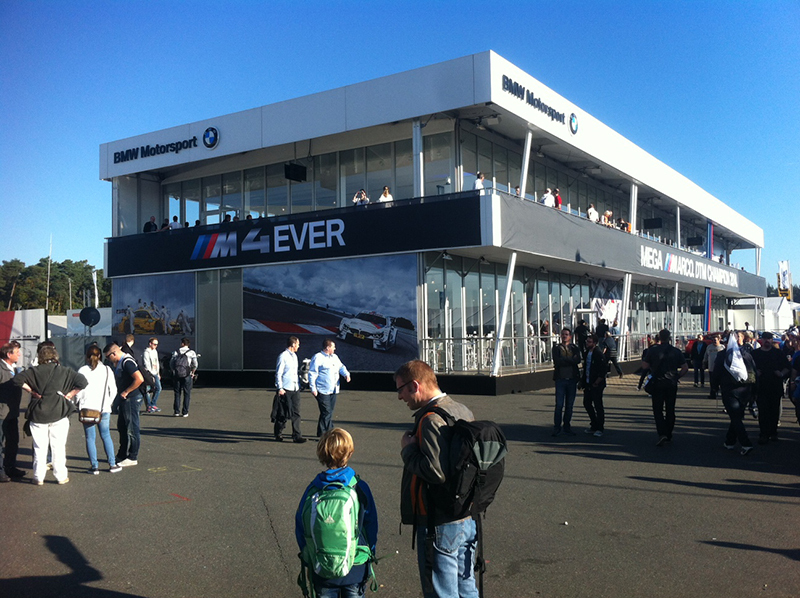 At the centre of the paddock, a new building inspired by the previous BMW DTM design and developed by Zelte Frank was erected. 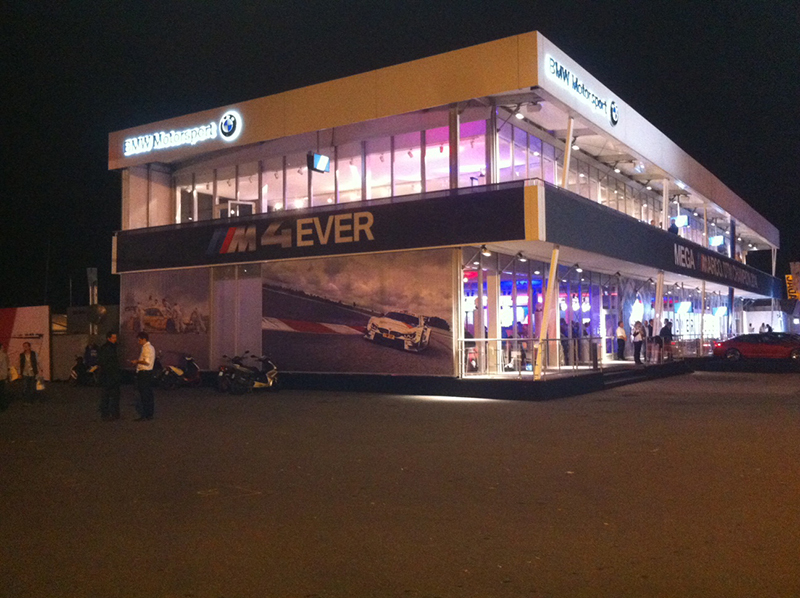 A building made of white aluminium frames and blue safety glass, with a floorspace of 350m2 was constructed. 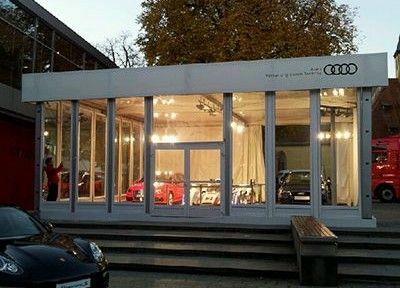 Even the doors were adapted to the design with white portal frames and frameless blue glass doors as well as a special floor-level closing mechanism. 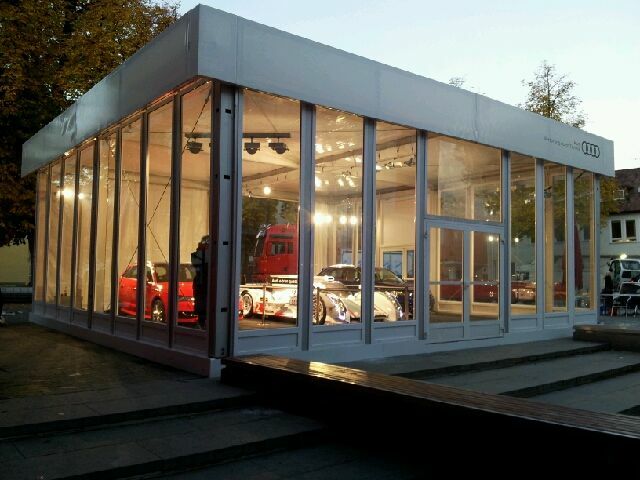 The invisible underlying structure of the surrounding fascia made from aluminium sections was finished with a taut, crease-free tarpaulin covering. 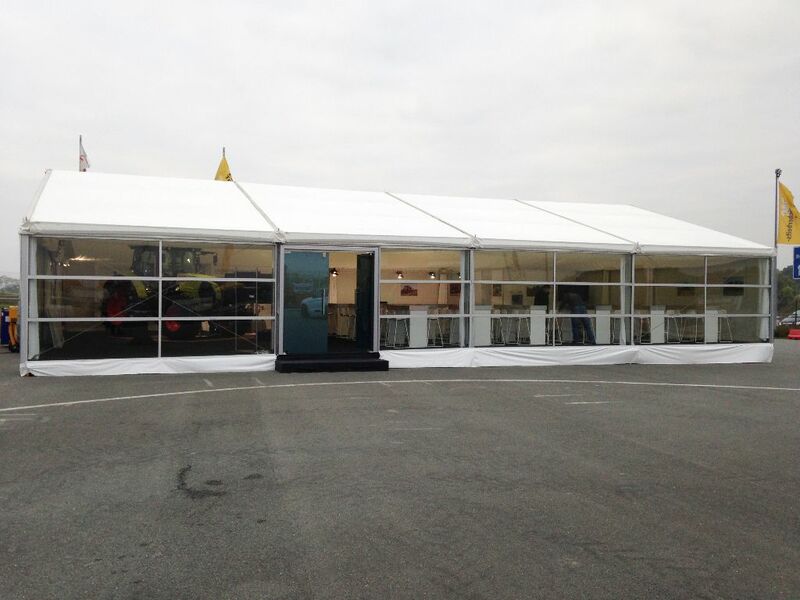 Zelte Frank also supplied kitchen and WC containers as well as the entire internal room branding. 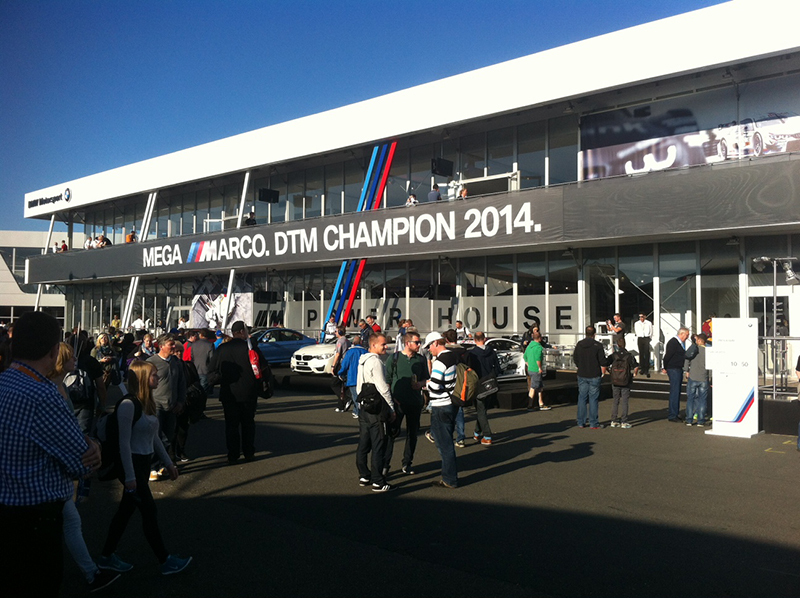 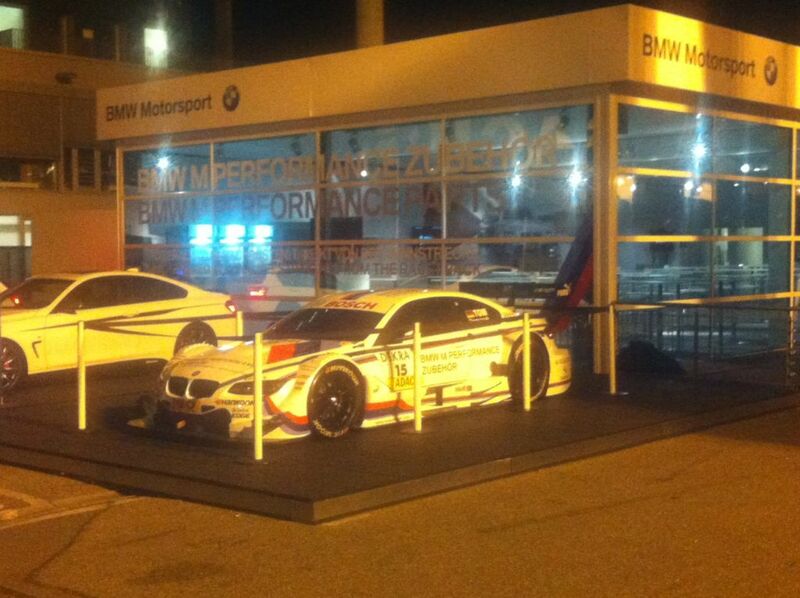 BMW managed to defend its brand title once more at the DTM and provided a successful weekend all round. 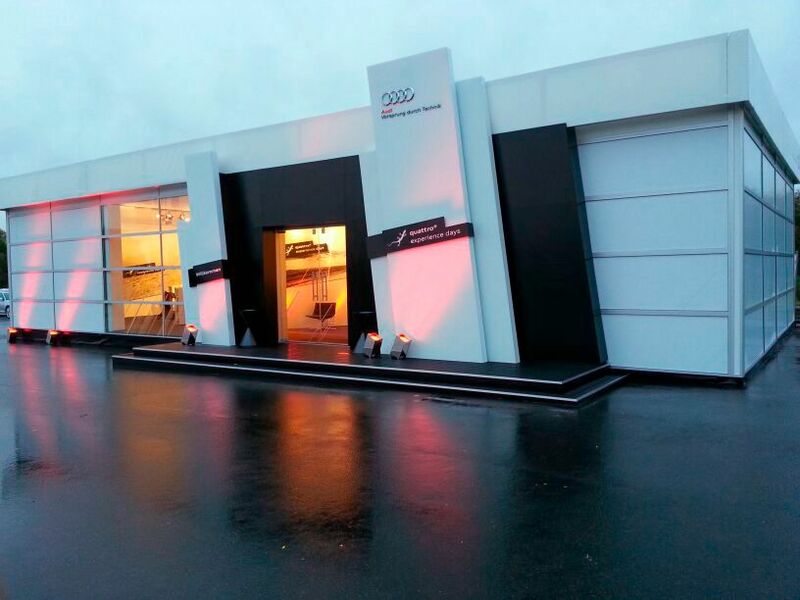 Audi is defining new set-up times. Taking just 36 hours from commissioning to finished construction, a glass cube with a floorspace of 100m2, wall height of 4 metres and a thermal roof was put together for Audi in Stuttgart. 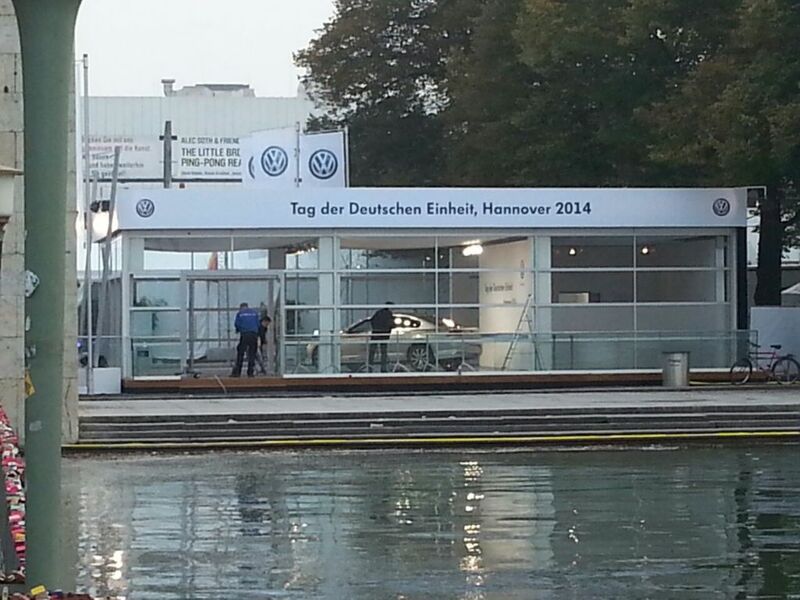 3 cars were able to fit on the non-anchoring floor. 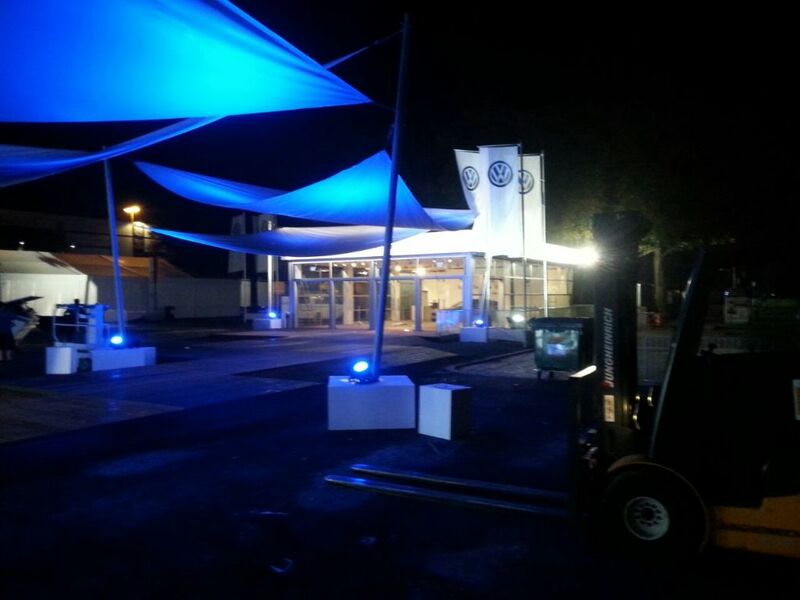 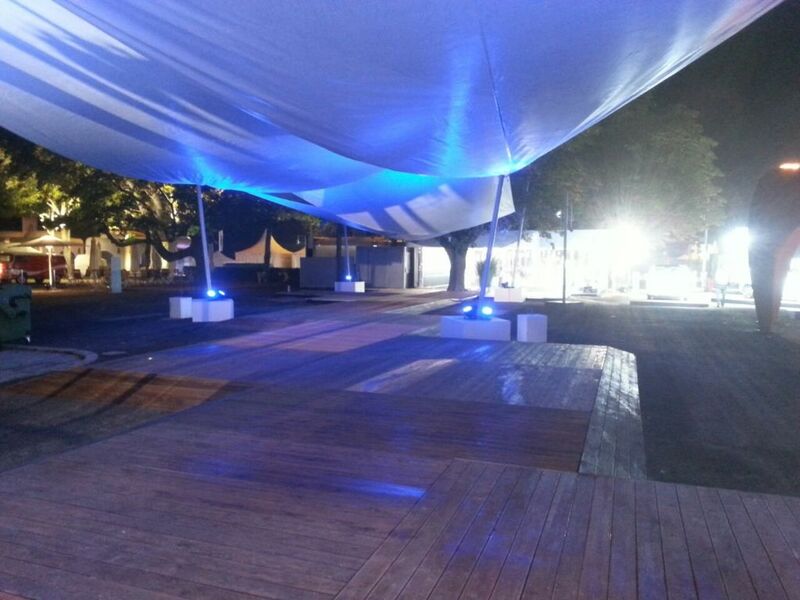 The company's expertise and experience in event logistics is held in high esteem worldwide. 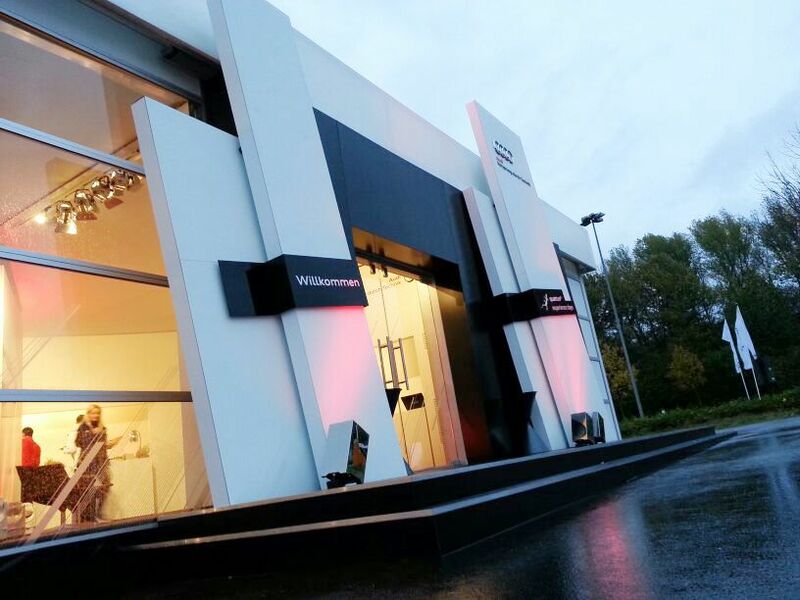 The company features both creativity and quality in its space solutions as well as striking efficiency in organizational matters.